Shriner’s International established in 1870 is headquartered in Tampa, Florida, and is well known for it’s charitable Hospitals for Children, a network of twenty-two hospitals in the United States, Mexico, and Canada. 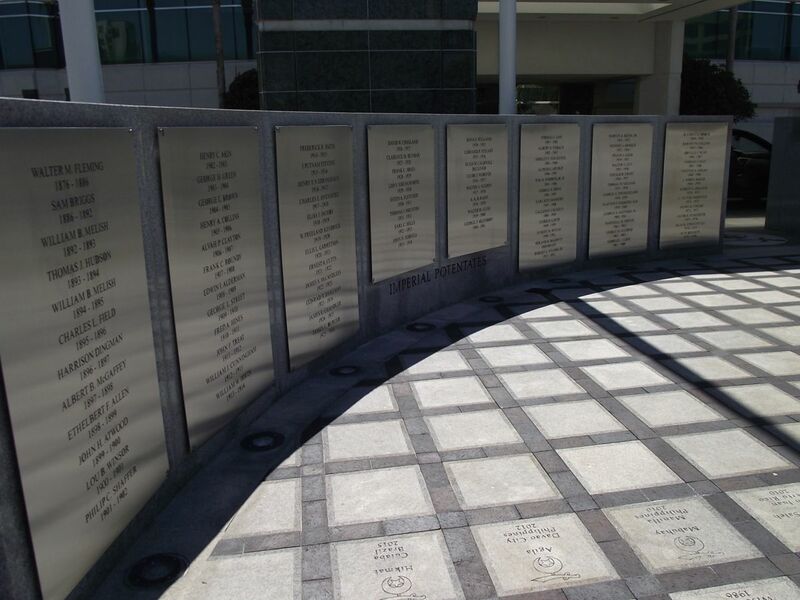 The entrance to the Tampa headquarters features a statue fountain and commemorative plaza including a pair of semi-circular walls adorned with the names of those who have served as the Imperial Potentate since the societies founding inscribed in granite. It’s enduring history however lead to a problem that had to finally be addressed this year, the granite surface had been filled leaving no space for future Potentates. In need of a solution the Shriner’s reached out to a previous project partner, Nathan Carr of Willis A. Smith Construction for assistance. A plan was developed to provide a series of polished stainless steel panels etched through with the names and backed with bronze to maintain the classic feel of the plaza. Gulf Coast Signs was recruited for budgeting the project and to assist with prototype developments through the first six months and multiple revisions of the project and once approved set about bringing the final designs to fruition. To create the panels Gulf Coast Signs partnered with a stainless steel expert to have the twelve 316L Stainless Steel panels laser cut with the names and dates of all Imperial Potentates that were then chemically bonded to polyester clear coated metal background panels. These panels were then mounted with standoff hardware in pre-drilled holes with Hilti 200 adhesive. Upon completion this Spring the plaza now stands proudly honoring those who came before with room for many more to come. Gulf Coast Signs of Sarasota, Inc.